Witnessing Amy’s solo performances at open mic sessions in New York’s Capital Region, guitarist Richard Green saw an opportunity to combine his own blues guitar chops with a gutsy female singer with the potential to lead a great blues band. The Amy Ryan Band was soon born. Melding together Amy’s country blues mojo and Richard’s urban blues and rock sensibilities this musical partnership is rounded out by bassist Sean Allison, drummer Al Bauman and keyboard player Ed Stein. 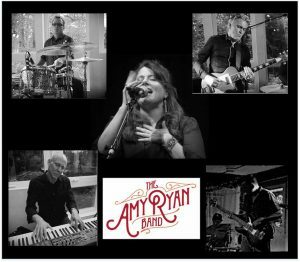 With a repertoire that includes band adaptations of Amy’s self-penned solo tunes, newly minted originals and select covers the Amy Ryan Band rocks the blues. Amy Ryan (lead vocals and guitar) – originally from New Hampshire and currently a resident of Castleton-on-Hudson, Amy’s bluesy voice quickly distinguishes her from run-of-the-mill songstresses. Whether accompanying herself on a finger-picked country blues or wailing with the boys in the band she’s got what it takes. Richard Green (guitar and vocals) – originally from Sheffield, England, Richard’s love and command of the blues fits Amy’s voice like a glove. Richard has been active in blues and blues-rock bands since he played with Sheffield, England outfit “Steppin’ Out” in the early ’90’s. He also logged a number of years with Columbia County-based blues band “Kid Kurt and the Bad Boys”. Sean Allison (bass) – originally from Westchester County, New York Sean is now based in Hudson. In addition to being a fine bass player Sean also plays Pan drum in the experimental group “Steely Din”. Al Bauman (drums) – Pittsfield, Mass. resident Al (former resident of East Greenbush, NY) is also a Berkshires mainstay. Al also plays with the band 8 Foot River with Ed. Ed Stein (keyboards) – NYC resident and part-time West Stockbridge, MA resident, Ed also plays with 8 Foot River and with Mary Anne Palermo and First Take.